Freelin-Wade Tubing Featured on World's Greatest! FREELIN-WADE FEATURED ON TV SHOW, "WORLD'S GREATEST..."
Freelin-Wade has been featured on the television show "World's Greatest!...". Now in its seventh season, "World's Greatest!..." takes an insightful, informative look at companies, products, and technologies that are considered best-in-class. The "World's Greatest!..." film crew spent an entire day at the McMinnville, OR facility capturing the passion that Freelin-Wade employees put into every product produced. Freelin-Wade's segment highlights the history of Freelin-Wade, its products and what makes their approach to plastic tubing so unique! You'll be amazed at the variety of items made from plastic pellets. The episode aired on various cable and satellite networks November 18th and 25th. Please check out the video now. "World's Greatest!..." is a fast-paced tour around the world featuring behind-the-scenes footage and interviews of some of the most amazing and unique companies, products, people, and travel destinations the world has to offer! Founded in 1980, Freelin-Wade is North America's largest independent manufacturer of plastic tubing and hoses. Recently, Freelin-Wade was awarded the 2012 Outstanding Business Volunteer Program Award for serving Oregon and its people. To learn more, please visit www.freelin-wade.com. 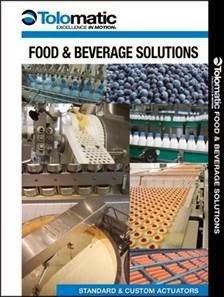 Did you know that Tolomatic has USDA approved actuators? If you're interested in receiving a print copy, Contact your FPE Solution Specialist. Check out this new video posted on YouTube that shows a robot from XPAK USA (North Brunswick, NJ) with Piab vacuum products (piCLASSIC, piGRIP with piSAVE sense valve) erecting various size boxes without any changeover.